My family loves soup. And now my little Hari joins this group of soup lovers as he demonstrates his fondness by trying to dig his little spoon into the bowl and relishing the taste by feeding himself and his clothes. I don’t care very much for this liquid concoction unless it is hearty like this one. The other exception being on a cold and wintery or rainy day when a small cup of hot and peppery soup could perk me up and make me feel warm from within. But this time it was different! Struck with a bad cold and trying to heal myself naturally by eating the right kind of foods spiked with pepper, ginger and lemon, my body craved for some spicy soup laden with vegetable goodness. Hot & Sour Soup is Ro’s favourite soup and the one he invariably has whenever we dine in a Chinese restaurant. And each time he asks me to make this at home, I say I will and somehow never get around to making it. This has been going on for 8 long years! I had not cooked Chinese for a long time too and that’s when I thought enough was enough and that procrastination could not get the better of me! 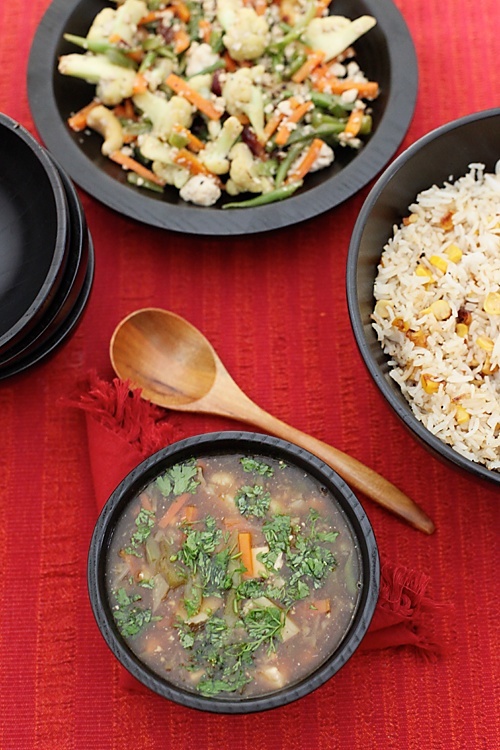 I decided to spring a surprise on Ro at lunch time this week and made this soup with some burnt corn fried rice and stir fried vegetables with cashews and cranberries. I decided to rely on the healing powers of lime and use it in place of vinegar. Cooking Chinese/Indo Chinese meals always brings fond memories as it was one of the first cuisines I had cooked for Ro when he was not yet my husband. As expected, in the studio when Ro opened his lunchbox, he was amused, surprised and thrilled! A pity that I wasn’t there to see his expression but the sms that followed post the meal said it all! And quite surprisingly, despite the chilli hotness of the soup, Hari ate a few spoons too. He loved the rice too but kept the corn aside. With both my men satisfied, my day was made! You could use your favourite seasonal vegetables here. 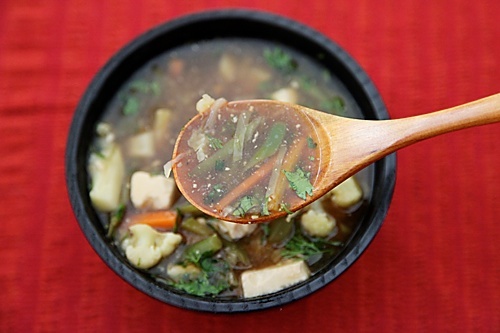 Bamboo shoots, if you can source them, go extremely well with this soup. In a saucepan, heat the oil over medium heat. Stir in the slit green chillies and ginger and cook for a minute or two. Put in the bell pepper, cabbage, carrots, french beans and the caulifower, each at a time and stir fry for 3 to 4 minutes. Add the sugar and pepper powder and stir fry for a minute more. Add the water or vegetable stock if using, soy sauce, salt and tofu and bring to a boil. Lower the heat, add the cornstarch mixture, increase the heat to medium and boil again. Stir in the lemon juice or vinegar and turn off the heat. *Add 3 to 3 tbsp cornstarch if you desire more thickness. I really like hot and sour soup. One of the very few soups i actually enjoy among our regular Indo Chinese soups. Never really attempted to make it at home. 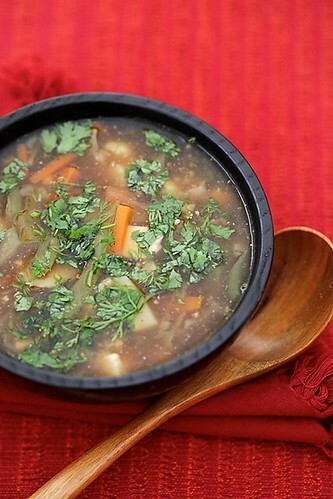 Hubby has been craving something spicy with the monsoon and cold bangalore weather and this sounds like the perfect soup for a cold evening. not sure if my daughter will have much as she is not a fan of spice. thats a perfect soup. I m not a soup person the only soups i love to have is tom yum soup and this one..never tried it at home..
Yum, that looks superb, I need to keep the recipe. Chinmayie: This is perfect for the monsoons…I assure you…hope your husband loves it! Mallika : It sure is very healthy! Kadhyaa: You must try it at home if you love it! Its a breeze to make! Ashwini: Wonderful! Thanks for reporting your success! You always make everything look so elegant. 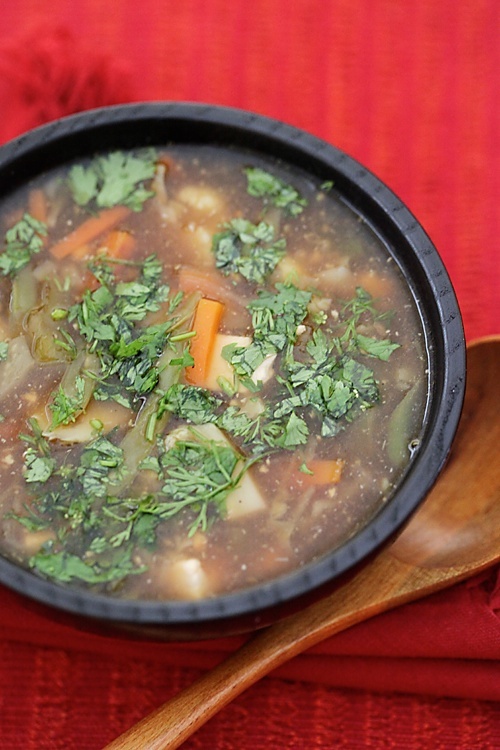 This soup looks sensational! Bravo. Soup looks wonderful and tasty .My first visit here you have a nice space . Do drop by simply.food sometime. I can't wait to make this, it looks delicious. Found you on Tastespotting and I'm glad. Thank you for such yummy recipes! Could you please tell me a substitute for ginger? Thank you everybody for the kind and wonderful words. NSJ: Sorry, it took me so long to reply! Somehow missed this! Asafetida is a good substitute for onion and garlic..so I guess you could use a little of that to substitute for the ginger too. Nina: Those are interesting substitutes. Glad you enjoyed this! Hi Anu, I made this today.. It tasted very good! I only found it a little on the spicier side. So next time, I am going to skip the green chillies and may be increase the black pepper by a small amount.. Thanks for those clear & detailed instructions.